Syria envoy Staffan de Mistura calls for condemnation as regime bombards civilians in areas seized by rebels, killing scores. 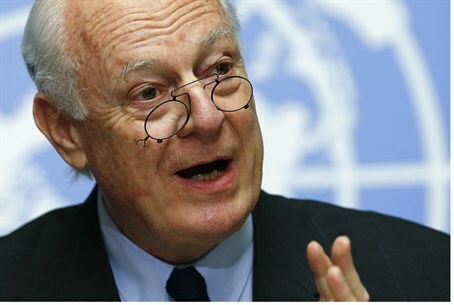 The UN envoy to Syria condemned the reported killing of more than 70 civilians by barrel bombs dropped by regime helicopters on northern Aleppo province. "The news of aerial bombing by Syrian helicopters on a civilian market area of the Aleppo neighborhood of Al-Shaar deserves the most strong international condemnation," envoy Staffan de Mistura said in a statement after Saturday's attack. The Syrian Observatory for Human Rights said "at least 71 civilians were killed, and dozens wounded" in the bombardments of Al-Shaar and the jihadist-controlled town of Al-Bab. Al-Bab saw the worst carnage, with 59 men killed in an attack on a busy market, Observatory director Rami Abdel Rahman told AFP. Barrel bombs - crude weapons made of containers packed with explosives - have often been used during Syria's civil war, with schools, hospitals and markets frequently among the targets. "The use of barrel bombs must stop," Mistura said, calling the air force attacks "totally unacceptable." Shortly after his statement was released news surfaced of another barrel bomb attack, this killing some 20 civilians in Idlib.